Quality assurance matters to manufacturers. The reputation and bottom line of a company can be adversely affected if defective products are released. If a defect is not detected, and the flawed product is not removed early in the production process, the damage can run in the hundreds of dollars per unit. To mitigate this, many manufacturers install cameras to monitor their products as they move along the production line. But the data may not always be useful. For example, cameras alone often struggle with identifying defects at high volume of images moving at high speed. Now, a solution provider has developed a way to integrate such existing systems into quality assurance management. Mariner, with its Spyglass solution, uses AI from Azure to achieve visibility over the entire line, and to prevent product defects before they become a problem. And worst of all, dissatisfied customers that demand returns. Too many variables make product defect analysis and prediction difficult. Manufacturers need to perform a root cause analysis across a manufacturing process that has complex variables. They want to determine which combinations of variables create high-quality products versus those that create inferior products. But to achieve this precision, the manufacturer needs to aggregate data across multiple systems to return a comprehensive view. Legacy vision systems lack the precision of AI-based defect detection systems. Manufacturing processes can be incredibly complex, and older vision systems are often unable to consistently and accurately identify small flaws that may have a large impact on customer satisfaction. Also, false positives can bog down production schedules. Additionally, the inability to aggregate data from multiple production lines or factories to determine the cause of variations in quality across multiple sites prevents a holistic view of operational efficiency. 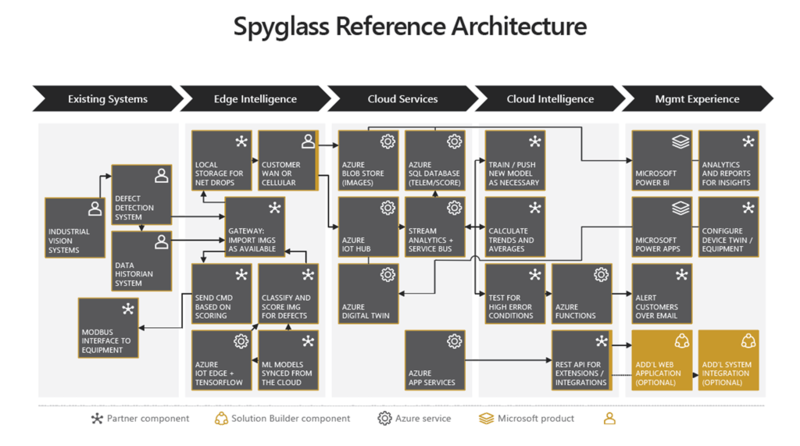 Spyglass Visual Inspection, powered by Microsoft Azure is an easily implemented, rapid time-to-value QA solution that can reduce costs associated with product defects and increase customer satisfaction. Manufacturers work with images from any vision system so companies who already have systems in place can leverage them for additional return-on-investment (ROI). By using cameras and other devices already in use on the production floor, the solution takes a lean approach to implementing new and emerging technologies like IoT, Cognitive AI, and computer vision. This ensures that manufacturers control costs and achieve value at every stage of production. The figure above outlines the architecture of the solution. Data from existing systems is placed at the front. Edge computing provides on-premises processing. The data moves to storage on Azure, where it is further processed. AI can then be applied, and the results viewed using Power BI for insights into the system. Rapid ROI: Easy implementation and ramp-up enables immediate process improvements and a rapid return on your investment. Greater visibility: Predictive analytics and root cause analysis drive quality improvements across multiple lines or sites. Leverages existing vision systems: Extracts more value from existing industrial cameras and devices by augmenting them with AI-driven real-time insights. Microsoft Deep Learning Virtual Machine, A neural network extracts rich information from images to identify defects. Azure IoT Edge ingests images from industrial cameras on the production line and runs cloud AI algorithms locally. Azure IoT Hub receives images, meta data from images, and results from the defect detection analysis on the Edge. Azure Stream Analytics enables users to create dashboards that offer deep insights into the types and causes of defects that are occurring across a massive number of variables. Azure Data Lake Storage/Blob Storage stores the data. Because heterogeneous data from multiple streams can be stored, additional data types can be added to image-based analysis. Azure SQL Database is used to store the business rules that define what a good or bad product is and what alerts should be generated in the analytics. Azure Functions/Service Bus generates rules that trigger alerts so you can capture the most meaningful data for business users. Power BI provides interactive dashboards that make data easy to access and understand, so users can make analytics-driven decisions. Power Apps creates additional applications for manufacturers to act on the data and insights they have received. Go to the marketplace listing for Spyglass and select Contact me.